Research shows that being part of a supportive peer group helps with recovery. These groups promote a sense of belonging and help people in recovery find meaning, purpose, and social connections. While more traditional groups meet face-to-face, some recovery communities have recently developed ways of providing support on the Internet, building solidarity via platforms such as Instagram. Surely, when the 2.5 million people seeking help with substance abuse join together online, inspiring things can happen. To better understand the impact of online sobriety and recovery support, we analyzed over 800,000 Instagram posts with sobriety or recovery-related hashtags. Our results show just how powerful connection can be during the recovery process. We analyzed ten popular hashtags — five of which related to recovery and five of which related to sobriety — to discover how communities discussed these two different stages of the recovery process online. Our investigation revealed that the hashtag #SoberLife was the most popular hashtag among the recovery community on Instagram, accounting for nearly a quarter of a million posts. Users who posted with #SoberLife often included before and after photos of themselves from addiction to sobriety. Why were transformation photos so common? These types of posts may be easier for people to share instead of documenting the darker, uncertain parts of the recovery process. Transformation posts may also be easier for those on the outside looking in to show support: comments of encouragement below #SoberLife posts were common. The next most popular recovery and sobriety hashtag was #RecoveryIsPossible, with 175,000 posts, followed by #Sobriety at 171,000 posts. Users who featured these hashtags often included other terms such as “clean,” “possible” and “sober” — indicating a sense of hope, positivity and life beyond substance abuse. While online support communities encourage positivity, recovery isn’t always hopeful — there are moments of doubt and struggle throughout the journey. We analyzed Instagram posts to discover how sentiment fluctuated throughout different points of the day and during different seasons of the year. Our analysis found that recovery posts peaked in positivity around August, while sobriety saw modestly higher positive sentiment in February, July, and September. Overall, post sentiment was more negative during the winter months for both sobriety and recovery posts. This could be linked to seasonal depression which affects many people during the winter months and can make maintaining sobriety difficult. To better understand sentiment trends, we analyzed post sentiment by time of day. 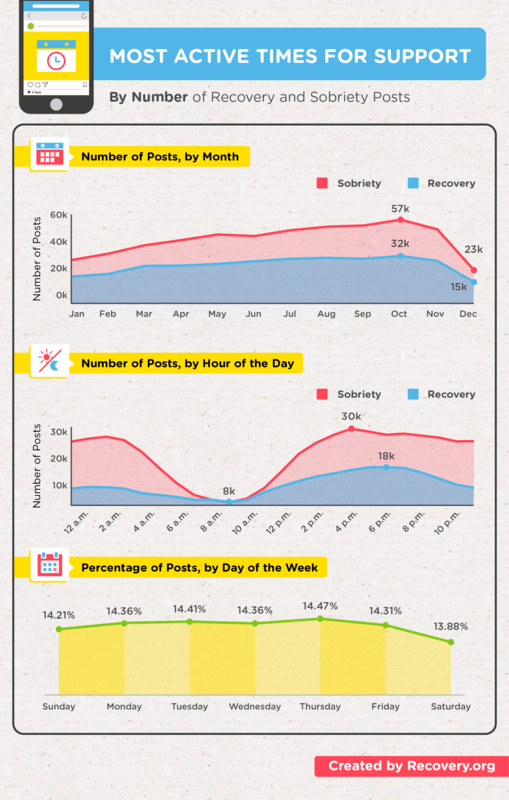 Sobriety captions showed a steadily rising sentiment between the hours of 10 a.m. and 2 p.m., then a relatively steady drop until 9 a.m. For recovery posts, the trend was different, with captions seeing an increase in sentiment from 5 a.m. onward, rising until 12 p.m., and then dropping off until a spike at 8 p.m., after which sentiment slid downward until 4 a.m. Both sobriety and recovery captions saw a decrease in positive sentiment as night approached. According to the National Institute on Drug Abuse, family members who struggle with addiction “might not come home at night,” and evening is the time when party spots, such as bars and clubs, typically operate. For those overcoming addiction, nighttime can be an especially difficult time when temptations may overtake progress toward recovery. Today I am grateful, blessed and proud. For the last 1,576,800 minutes of my life, I have experienced the control, strength and consistency that previously seemed unimaginable. Today, I am 3 years sober. Are individuals less likely to share during particularly difficult times of the year or difficult points during the day? We took a look at the volume of posts during different hours of the day and months of the year to see if there were any correlations. Both recovery-related and sobriety-related posts peaked around the month of October and then steadily declined until the end of the year. Again, seasonal depression may be hindering progress for many individuals in their recovery journey and may deter people from posting during such emotionally difficult times. Additionally, the holiday season can be challenging for sober men and women, especially when facing that first sober holiday. 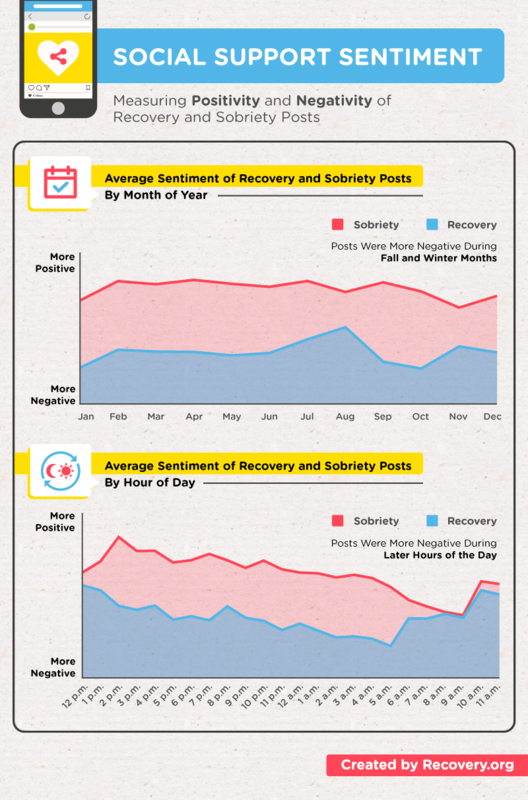 When we looked at the time of day when recovery and sobriety posts were most frequent, we found that activity rose steadily from 10 a.m. until peaking at 4 p.m. for sobriety-related posts.This aligns closely with the sentiment analysis — indicating that people posting about sobriety were more likely to post when they were in good spirits. For those posting about recovery, the volume of posts rose steadily from 10 a.m. until 6 p.m. This seems to be an inverse relationship — as post sentiment declined, the volume of posts increased, indicating that people posting about recovery may be searching for support during difficult points in the day. While support communities may be used to ask for strength during dark moments, the majority of recovery and sobriety posts delivered encouragement. 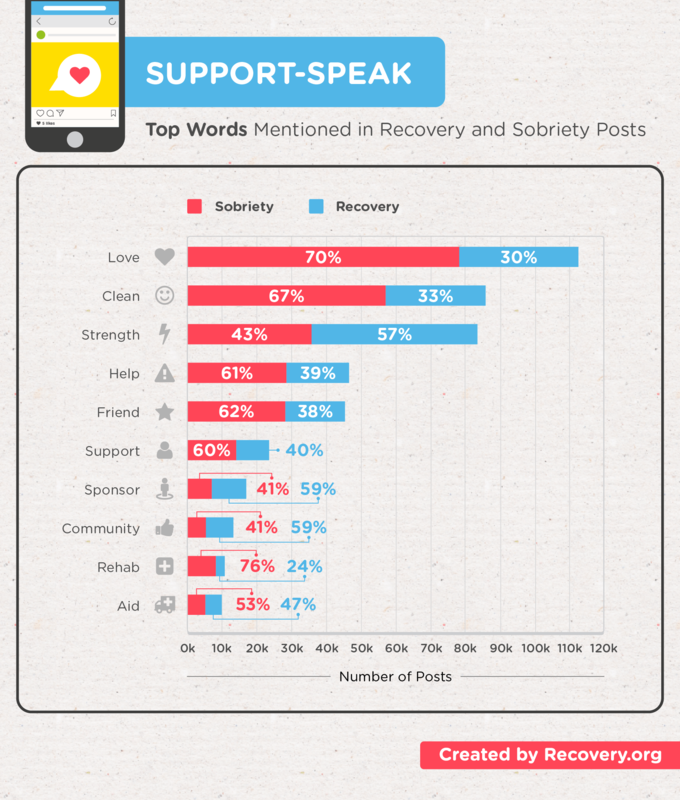 “Love” was the top term used in recovery and support communities on Instagram. Seventy percent of the time, it was linked to sobriety-related content, while 30 percent of the time it was linked to recovery-related content. “Clean” was the second most popular term for both communities, gaining 67 percent of its usage from sobriety content and 33 percent of its usage from recovery content. The third most used term was ”strength” – and it was used more often by the recovery community (57 percent of the time) than the sobriety community (43 percent of the time). These top three terms capture the culture of positivity in online recovery communities. Publishing a personal story of addiction and recovery is inspiring; however comments from friends and followers indicate that personal stories of addiction spark more than just support — they also instill hope for other viewers regardless of their personal struggles. “Love,” “strength” and “clean” are not specific to the struggles of rehab, but speak to the greater journey of life — often rife with struggles and roadblocks that can be overcome with support. Which States are Sharing Messages of Support? While online communities allow people from remote locations and cities alike to connect and find support, we observed interesting location-based data which demonstrated that offline awareness and education in particular cities may be encouraging online connections and spurring decisions to enter treatment. 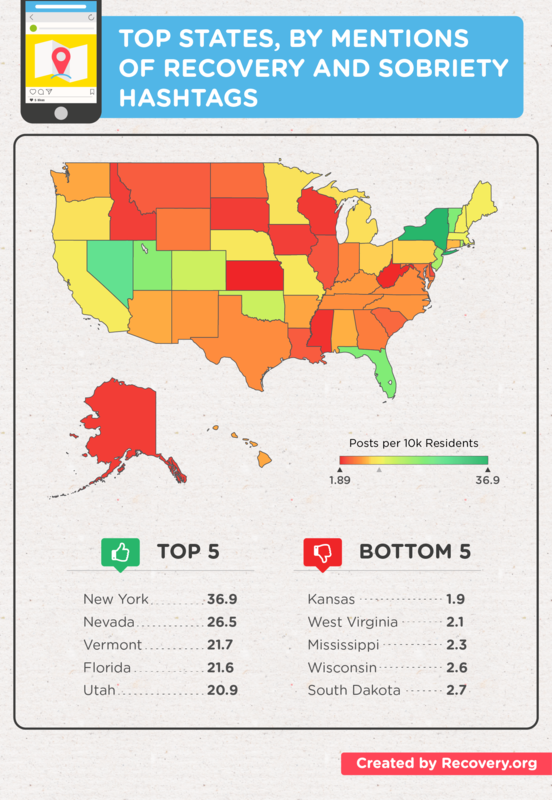 Looking at the top states by mentions of sobriety and recovery hashtags, New York ranked as the top result, with 36.9 posts per 10,000 residents. It was followed by Nevada, with 26.5 posts per 10,000 residents, then Vermont with 21.7, Florida with 21.6, and Utah at 20.9. This could be related to greater public awareness of the importance of recovery and sobriety in these regions: New York and Vermont, which placed third with 21.7 such posts per 100,000 residents, have continued to struggle with the heroin epidemic in the northeast, while Florida – in fourth with 21.6 posts – has also notably cracked down on overprescription of painkillers in recent years. The prominent public discussion of substance abuse recovery in these states may also be fueled by ongoing awareness initiatives addressing the heroin crisis, such as New York’s #CombatHeroin campaign and overdose awareness marches by community members in South Florida. Additionally, a number of these states show clear associations between social media discussion of these topics and measures of substance abuse treatment and recovery among state residents. Nevada, Florida, and Utah all exhibit a high level of offline social support for recovery: these states have some of the highest concentrations of Alcoholics Anonymous and Narcotics Anonymous meetings. And according to 2014 data from the Substance Abuse and Mental Health Services Administration, Vermont has the second-highest rate of admissions to treatment centers with 2,017 admissions per 100,000 people. New York, with 1,672 admissions per 100,000, also reported some of the highest rates of substance abuse treatment in the country. To better understand why certain states had lower participation rates in online communities we looked closer at factors affecting the bottom five states: South Dakota, Kansas, West Virginia, Wisconsin and Mississippi. Interestingly, while South Dakota was among the bottom five states for use of sobriety and recovery hashtags, this state had the third-highest rate of treatment admissions. The low levels of participation may be due to the fact that South Dakota’s population is much lower than states like New York. For the remaining states, we found a correlation between admission rates and online community involvement. West Virginia, Mississippi, and Wisconsin all have low rates of admissions for substance abuse treatment – with only 176 admissions per 100,000, Mississippi features some of the lowest treatment rates in the nation. This is not necessarily due to lower levels of substance use, as residents of Kansas and Wisconsin report above-average rates of alcohol abuse or dependence. One factor may be residents’ struggle to access treatment– the poverty rates of West Virginia and Mississippi are far higher than the national average. The rise of social media has empowered communities around the world to connect and support one another through life’s struggles, joining together for inspiration and motivation toward recovery and sobriety. These online connections may also encourage those in recovery to attend in-person support groups which provide greater opportunity for personal relationships and connections that are essential to recovery. At Recovery.org, we provide online support communities via our forums where participants share their personal stories of recovery and advice on treatment, detox and other facets of addiction recovery. Visit our homepage today to access our forums as well as our wealth of resources designed to help you or a loved one select the best treatment options for lifelong recovery. 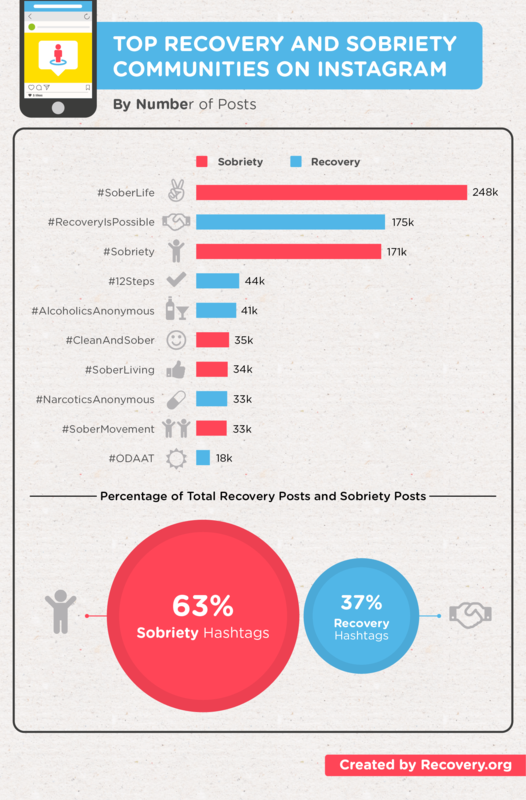 We analyzed over 800,000 Instagram posts related to sobriety and recovery through hashtags including #ODAAT, #AlcoholicsAnonymous, #NarcoticsAnonymous, #12Steps, #RecoveryIsPossible, #SoberMovement, #SoberLiving, #CleanAndSober, #Sobriety, and #SoberLife. Posts were collected between February 2011 and November 2016.